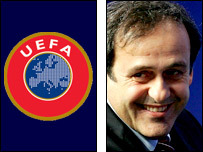 Uefa president Michel Platini has called for the G14 to disband and drop a number of lawsuits it is supporting. The G14 represents 18 European clubs, with Arsenal, Liverpool and Manchester United all current members. Platini wants the G14 to air their grievances through a new body - the Professional Football Strategy Council. "We can stop seeing each other before the courts, we can stop making a spectacle of ourselves in front of the whole of Europe," said Platini. The G14 has come into conflict with world governing body Fifa over its support for a number of court actions to gain compensation for players injured whilst on international duty. Belgian club Charleroi have taken Fifa to the European Court of Justice over a player who was injured while on international duty and a similar case is pending involving Olympique Lyon of France. Do you agree with Platini? Charleroi want compensation after Abdelmajid Oulmers was ruled out for eight months after being injured while on duty for Morocco, while Olympique Lyon launched a similar action after Eric Abidal broke his foot playing for France. Platini added: ""Presidents and heads of the major clubs - let us profit from your great experience and your ideas. "Tell us about your convictions. Uefa's door is wide open - join us, and I promise you that you will not be disappointed. "I am convinced that you will hear this appeal, because it is being made in the sense of history, and with progress at the service of football in mind."